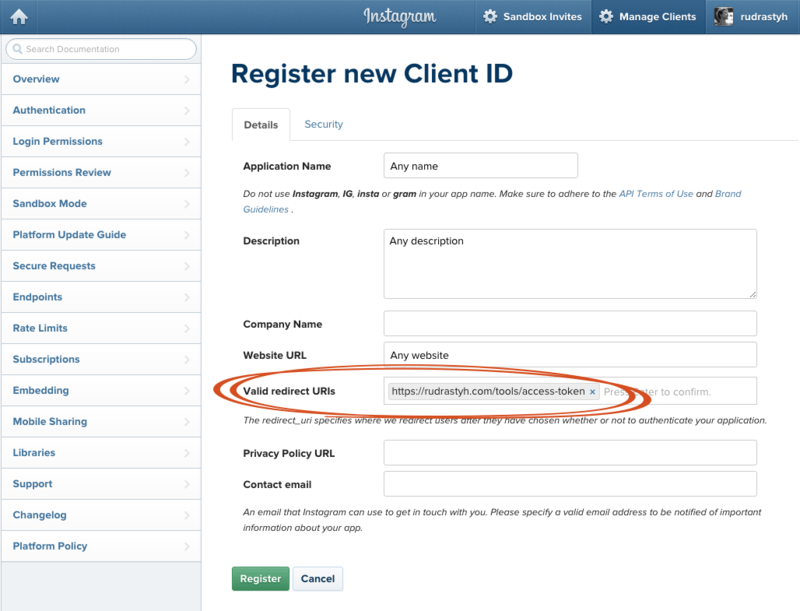 This free generator tool allows you to get Instagram access token and user ID using client id and client secret. To get images from Instagram using PHP. Read more here. How to Get Instagram Client ID and Client Secret? Watch this video or read the instructions with screenshots below. Go to app registration page and click . If you never visit Instagram API page, it may ask you some questions before you can create an app. On the "Register new Client ID" page specify any app name, any description and any website, but in the Valid redirect URIs field you should input the URL of this tool page – https://rudrastyh.com/tools/access-token. Once you generate your token, you can change it if you want. After clicking the button you will be redirected to Manage Clients page with all your apps where you will find your Client ID. And the final step — click on the Manage button to get your Client Secret. Does it still work in 2019? Yes, all my Instagram tutorials are updated according to the latest Instagram API changes. If it doesn’t work for you, please let me know.